Contemporary world issues are complex and ever-changing, and Hungary is at the forefront. Gain insight into Europe’s current refugee challenges through a hands-on AFS Global Prep program in Budapest. Your program includes group visits to refugee camps, meeting the people who live and work there. You will also participate in a meaningful volunteer project helping refugee children tell their stories through art and creative writing. Global Prep participants stay with a local host family who will help you explore Budapest’s rich history, food, and culture. Students age 13-18 are eligible. 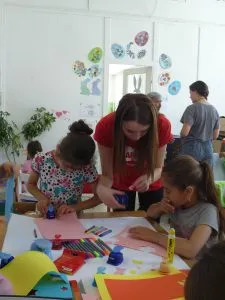 Once you’ve engaged with some of Hungary’s current relief efforts, you and your group will begin your own volunteer project: a creative writing workshop for children called Kids Tales. This non-profit was developed by AFS Vision in Action Award-winner, Katie Eder, and will be used as the basis for your volunteer program at the camp. As you help refugee children express themselves through art and creative writing, you’re bound to see evidence of the profound impact you and your friends are making in the world. To find out what it’s like to volunteer in Hungary, check out this blog post by a Study Abroad Specialist who went on last summer’s program. Enjoy Budapest like a local! As you near the end of your time in Hungary, you and your friends will go sight-seeing in Budapest. You’ll get to experience the city’s cultural history in areas like the Castle District, where you can see the Royal Palace and take in a panoramic view of the Danube River. During your tour, be sure to try some Hungarian food like goulash, a traditional stew made with meat, potatoes, and paprika. Before you head home, you and your group will have the chance to reflect on your intercultural experiences and take pride in all you’ve accomplished. After giving back to the community at nearby refugee camps, you’ll get to spend a long weekend with your host family in the countryside. This is a great time to immerse yourself in the culture as you share stories over the dinner table. Maybe you’ll practice some of the Hungarian you’ve learned and discuss your experiences at the refugee camps. Or your host family might give you a tour of local sites so you can gain insight into everyday life in Hungary.